Until last year, it was easy to know what to expect from Jacco Gardner. Visually, he fulfils the stereotype of a 60's psych-rock throwback and, sonically, his first records – 2013’s Cabinet Of Curiosities and 2015’s Hypnophobia - fit that bill as well. Then came Somnium, Gardner’s unexpected musical side-step in 2018. Gone was the fuzzy psychedelia to be replaced by an instrumental, synth-driven journey into the cosmos. Channeling the late 60s/early 70s faultline between rock and electronica personified by acts like Harmonia and Tangerine Dream, Somnium announced Gardner as a new type of artist. Named after the 1608 sci-fi novel of the same name by Johannes Kepler, often cited as the first book of its kind, Gardner brings past ideas of the future and an innate fascination with the possibilities of science and imagination to his new work. With a move to Lisbon, Somnium is also fuelled be Gardner’s immersion in the city’s culture, ideals, and winding streets, of exploring new places by yourself. So, as well as big lofty ideas about exploring the possibilities of science and the cosmos, the album is juxtaposed by very personal, inward journeys as well. Intended as a “multi-sensory and multimedia experience” from the off, it was fitting for Gardner to take this psych-synth exploration to Amsterdam’s Planetarium for a mind-altering explosion of sound and visuals. With the announcement that Gardner will bring his new direction to the London stage in May, I grabbed a few questions to delve into his choice to go voiceless, sci-fi influences. and how his move to Lisbon shaped the record. DiS: What was the motivation behind making an instrumental album? 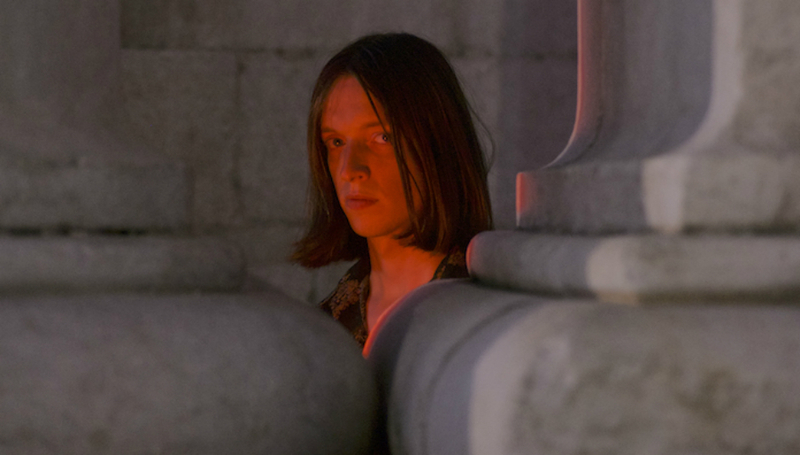 Jacco Gardner: I wanted to go deeper inside of the worlds that emerged from studio experiments, and to let this approach create a narrative beyond words. Words can be very binary and limiting. By removing your voice from the music, does that make it a less personal record for you? Less of yourself on show? To me, this choice makes the listening experience much more intimate. I want myself and others to experience the environments in my music as if walking around in them, which is more personal without a guiding voice that tells you where to go. I want it to be an invitation to explore, which would be more difficult with my voice being present. How has sci-fi influenced the music? How influenced by other musicians who have used sci-fi were you? I listen to a lot of kosmische muzik, and electronic music pioneers, mainly from the 70s. I think the psychedelic music from the 60s already opened a lot of doors to mystery and wonder, but I have the feeling that this became more distilled in the 70s, reserved for those areas where mystery is still undeniable, as is the case with the universe we live in. The sci-fi genre taps into this exact same approach. Often, I think that artists influenced by these topics are sci-fi artists themselves, and not necessarily only influenced by sci-fi cinema. I think both draw inspiration from the same source, which is just the world around us and what might be. This is quite a departure for you, musically. Does this record correspond to you discovering different types of music yourself or is it a natural progression? It feels like a natural progression because of the aspects mentioned before. I think this is my most psychedelic and otherworldly album yet, and this aspect has been a cornerstone of my entire career up until this point. I do not feel it as a departure for that reason, but more as a way to get even closer to that which has inspired me all along. How can an album be a ‘multi-sensory and multimedia’ experience? Are people that are not witnessing it in a live space not getting the full vision? There is no “full version”. One of the things I love of the current live situation is that the pillars of the structure of the album are always there, but every experience is still different. To combine these two elements, and to keep the album experience intact in a live situation, has been very refreshing and exciting. Why play in a planetarium? Because it is a place made for adventures, immersive experiences, introspective journeys, revelations, and transformative experiences. A place that awakens the sense of wonder for the natural world and is designed to do so. Aside from this, there are some key technological elements present that are needed for the live experience, like quadraphonic sound and comfortable seating facilities in a circular motion. I love that a planetarium is a place where people come to explore what happens around them. This element is very important to make the live experience have the same type of effect as a solitary album listening experience. How did you hope audiences would engage with the album? I hope the album will be able to offer a sense of wonder and to offer a momentary escape from a fast paced society with very little moments of true mystery. I hope it helps people to allow themselves to explore the endless imagination they carry within. What narrative is the album telling, if any? The album does not tell a specific story, though the “destinations” that one experiences listening to it are often influenced by emotional moments in my life in Lisbon. It was also intended to evoke a sense of adventure, so many moments on the album are universal in that aspect. Like the beginning, the adrenaline when everything starts to happen, the feeling of calm that comes after the successful escape, and the moment of relaxed exploration and introspective melancholic moments. I believe many of these sensations are universal to most adventures, but that is just a feeling I have. You can’t always tell with instrumental albums, but is anything directly reflecting the current world we live in? I think so and I think it would be impossible to do otherwise. What did being in Lisbon mean to the creation of this album? Lisbon offered me a sense of exploration and escape, and while in the middle of this process I translated that into music. I was able to remove myself from everything while having long walks wandering through the city. I feel like this city is good for that purpose, as there is a strong sense of history and mystery, often in unexpected places. The album portrays a real sense of movement and of exploration – was this intentional? Yes totally, though I do feel like the development in this direction was a natural one, not one I clearly chose. It just happened. Why use analogue synths – is it a deliberate connection with music of the past? Analogue can sometimes be experienced as more “alive” than digital in my experience. I feel a presence when I work with analogue equipment, an energy that might very well be psychological, but it drives my experiments to more interesting places than when I work purely with digital equipment. Do you consider this a ‘prog’ album? I think there is definitely a progressive aspect to this album, also in the fusing of different musical directions, but I find it difficult to label the album within one genre like this. There is a lot of prog I don’t like at all, and some of it that I absolutely love. So, I feel there is a need for nuance to label this album correctly. Somnium is out now on Full Time Hobby. For more information about Jacco Gardner, including forthcoming tour dates, please visit his official website.